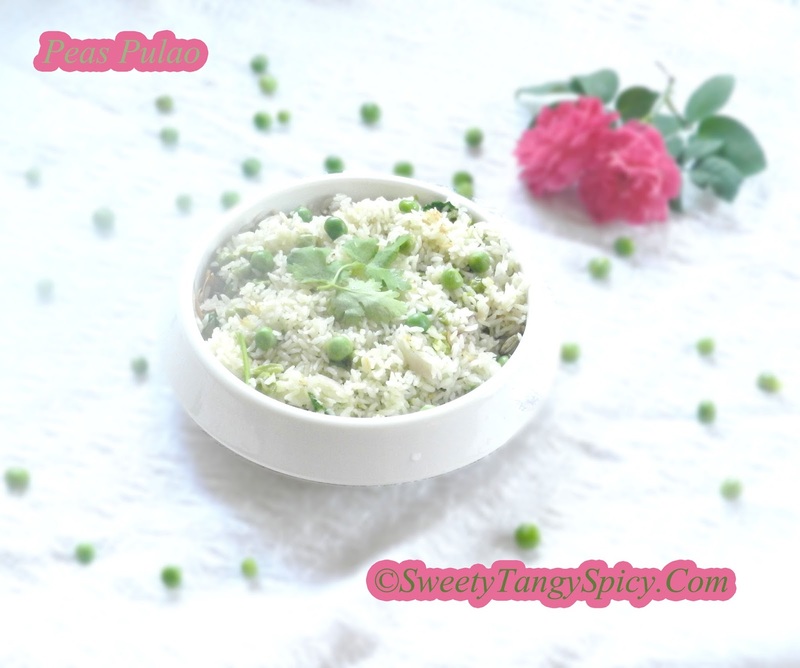 Today, I am sharing another simple rice recipe, the peas pulao. It is healthy and nutritious. Unlike other recipes, here rice is cooked in coconut milk. If you don't have coconut milk, you can use normal water. But do not forget to try coconut milk. It is awesome. A very easy and also an ideal lunch box recipe. Rinse, wash and then soak the rice in water for about 20 to 30 minutes. After soaking time, drain excess water and keep aside. 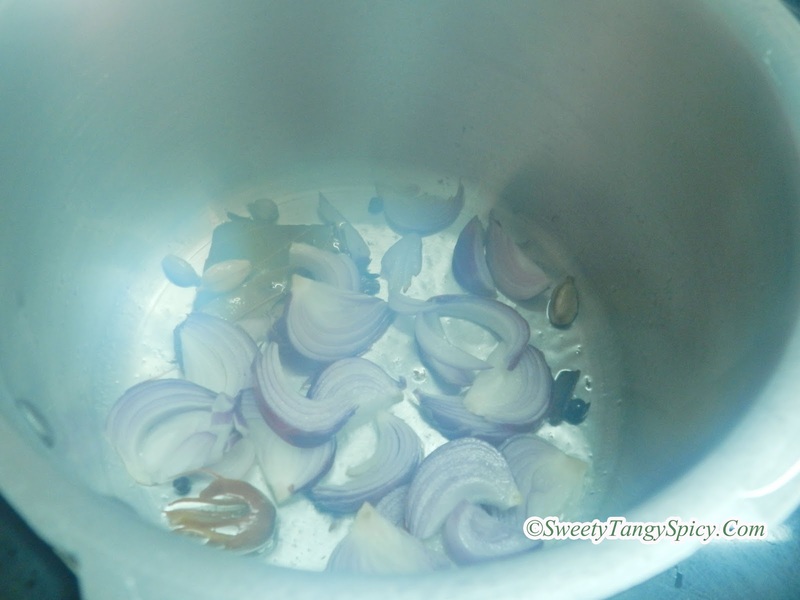 While rice is soaking, slice onions lengthwise. Crush, ginger, garlic, and green chilies. Keep aside. Heat oil in a pressure cooker on medium heat. 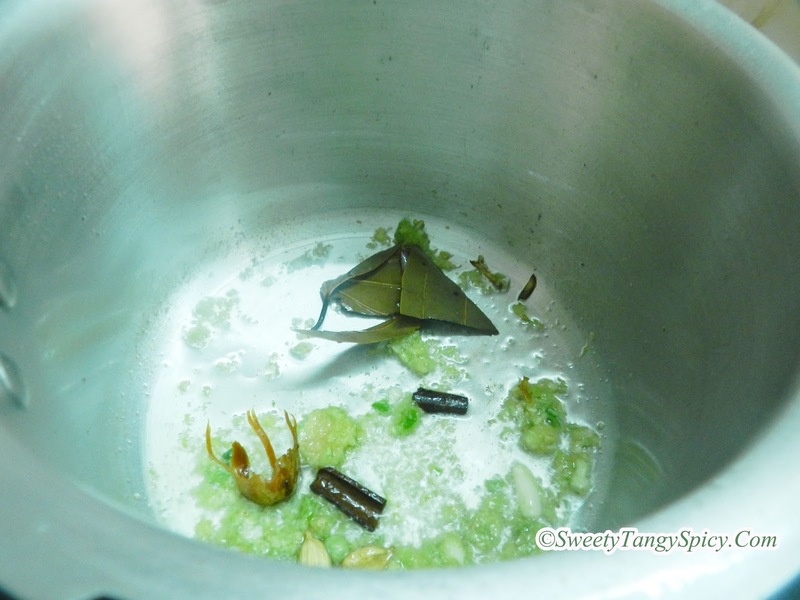 Once hot, add whole spices (like cinnamon, green cardamom, clove, peppercorns, mace and bay leaf.) and saute for a minute until you get a nice aroma of spices. Then add ginger, garlic and green chilly paste. Saute for one minute until it releases raw smell. 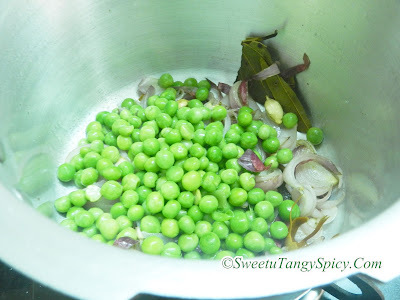 Add green peas (fresh or frozen) and saute for a minute. 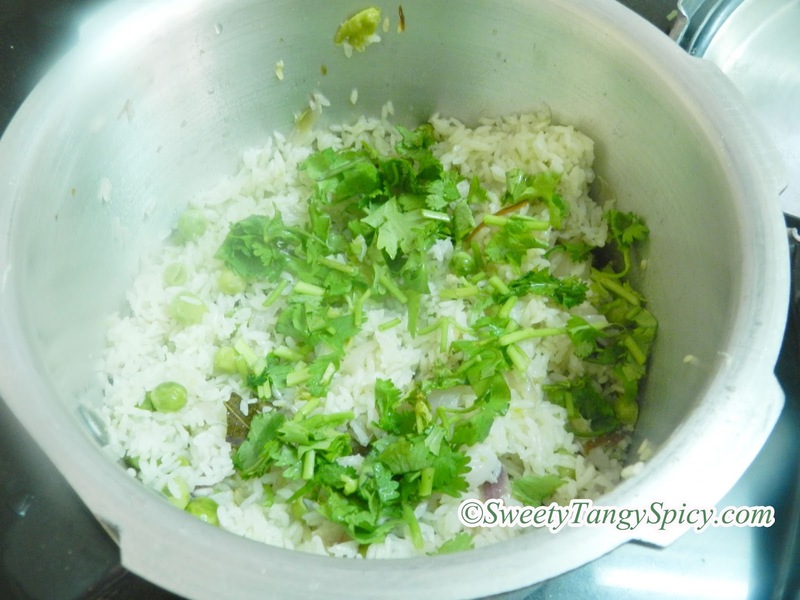 Add soaked, drained rice and saute till it splutters. Add enough salt and coconut milk (You can also use normal water) and pressure cook on low flame till one whistle. Once cooked, separate rice gently with a fork so that the rice grains do not break. Garnish with chopped coriander /cilantro leaves. Rinse the rice under running water for three to four times until water runs clear. 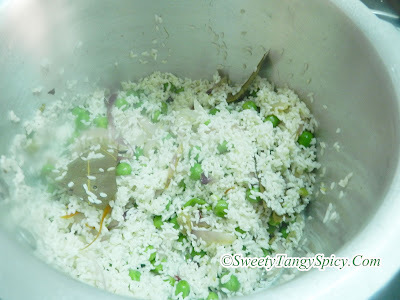 Then soak the rice in water for about 20 to 30 minutes. After soaking time, drain excess water and keep aside. Crush, ginger, garlic, and green chilies and keep aside. Then add ginger, garlic and green chilly paste. Saute for one minute until it leaves its raw smell. 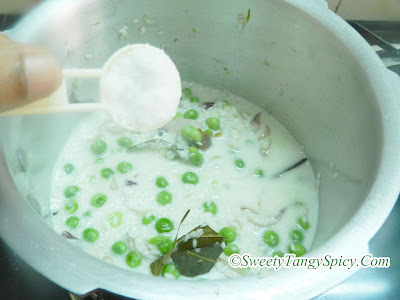 Add enough salt and coconut milk (You can also use normal water) and pressure cook on low flame till first whistle. Once cooked, separate rice gently with a fork so that the rice grains do not break. Garnish with chopped coriander /cilantro leaves. 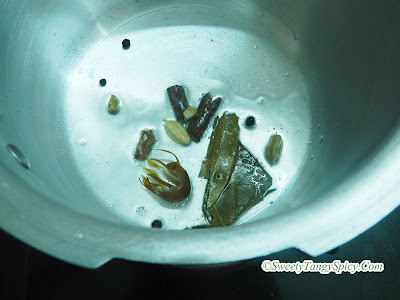 For pressure cooking, the rice, water ratio should be 1:1.5. If you are using stove method, take 2 cups of water for 1 cup of rice. However, different brands of basmati rice require different amount of water. 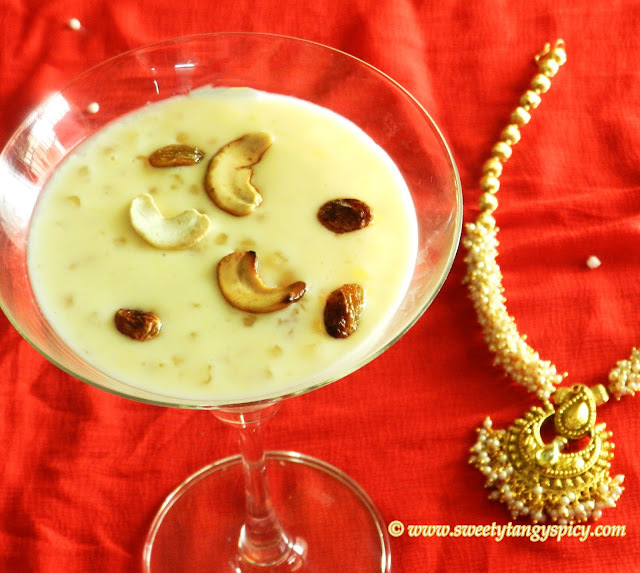 You can use normal water instead of coconut milk. But remember, coconut milk increases its taste.